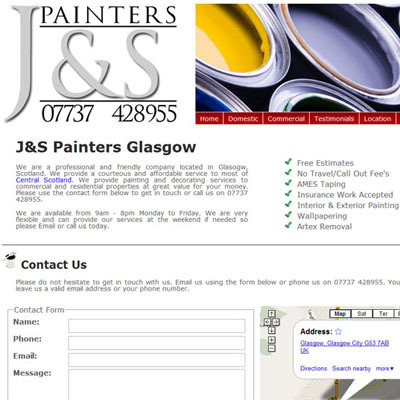 J&S Painters are a Painting & Decoration firm based in Glasgow. We created a neat website design to help bring more business in by getting an online presence. It includes a fully interactive map, contact form and customer testimonials page and a full image gallery. The website is fully Search Engine Optimised so it appears in search engines like Google, Yahoo and MSN for his business name and several other terms to help get more business. We can design you a website like this to fit around what you need contact us for more information.